Vitamins & MineralsTrec Mega Mineral 1300mg - 60 kaps. 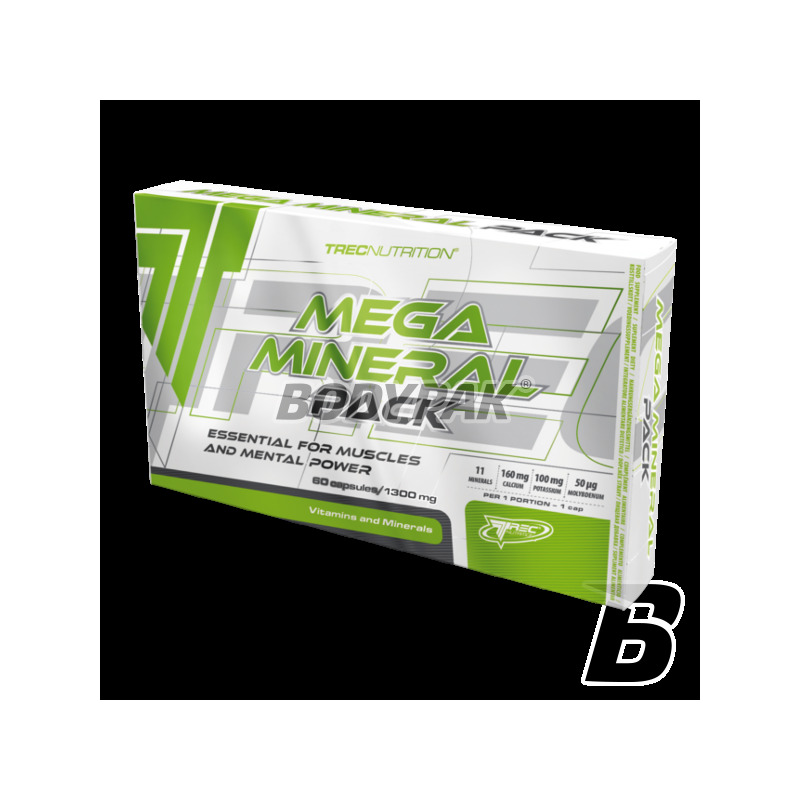 TREC MEGA MINERAL PACK is a complex formula that is readily available source of minerals and trace elements. Their adequate level is necessary for the smooth functioning of the whole body. Demand for minerals increases in physically active people and athletes, therefore, should be delivered regularly in the diet. TREC active ingredients MEGA MINERAL PACK help water and electrolyte and hormonal participate in the conduction of stimuli in the nervous system and regulate the metabolism of proteins and carbohydrates. Macro- and microelements constitute a group of indispensable elements, as the body can not synthesize them itself - therefore must be delivered in an appropriately balanced diet. They fulfill a number of important functions in the body: regulating water - electrolyte participate in the conduction of stimuli in the nervous system, build the body's cells and regulate metabolic processes of proteins and carbohydrates. Lack of these components is manifested in the form of mental vulnerability and immunology, decreased physical efficiency, painful muscle cramps, hyperactivity and anxiety of the body, decreased memory abilities. Maintaining a constant of all minerals is important primarily in athletes and people working hard physically, he and dehydration are lost the greatest amounts of these ingredients. 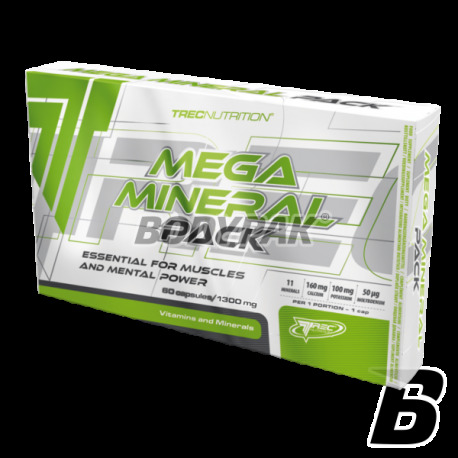 TREC MEGA MINERAL PACK TO HIGH QUALITY PREPARATION ARISE ABOUT MINERALS IN THEIR BEST forms! The preparation drink juice. 300 mL of water. The recommended daily allowance is 1 capsule 2 times a day, preferably immediately after a meal. Składniki: Mega Mineral Complex [fosforan wapnia, węglan potasu, tlenek magnezu, węglan magnezu, fumaran żelaza, maltodekstryna - nośnik, siarczan cynku, siarczan manganu, siarczan miedzi, jodek potasu, chlorek chromu, molibdenian sodu, selenian sodu], stearynian magnezu - substancja przeciwzbrylająca, żelatyna (A)/(B) celuloza - patrz symbol partii produkcyjnej. NOW Foods Niacin - 100 kaps. Sport Definition Essence Selenium is a dietary supplement that supplements selenium deficiencies in the body. Each tablet of the preparation contains 200mcg of this valuable element.